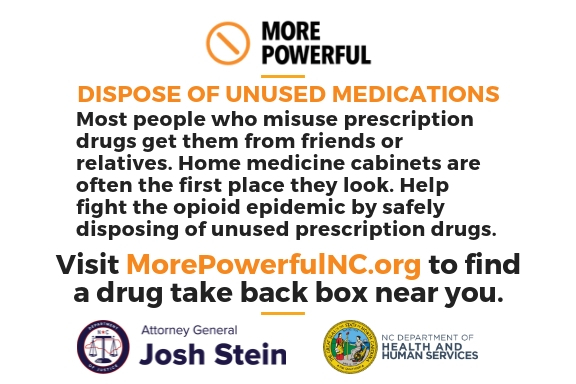 Connect with others in your community and get involved in local efforts to address the opioid epidemic in North Carolina. Connect with others in your community and get involved in local efforts to address the opioid epidemic in North Carolina. Remember: together, we are more powerful than opioids, and we can all help end the epidemic. Find groups who are working to address the opioid epidemic in your area with this map and county list. The NCDOJ’s Opioid Resources website highlights creative local efforts to address the opioid epidemic across our state. Community coalitions and local governments are using a wide range of innovative strategies to address the opioid epidemic. The best strategies are supported by data and an understanding of effective prevention strategies. Encouraging community members who need help to find treatment, recovery resources, and support for those helping a loved one with addiction. Supporting community members in treatment and recovery by getting the facts about addiction, treatment and recovery, understanding myths and misconceptions, and expanding support services. Encouraging community members to dispose of leftover medications and secure medications that are in their home. Encouraging community members to talk to healthcare providers about the risks associated with prescription pain medications and alternatives to opioids for treating pain. Encouraging community members to talk to their kids, families, and loved ones about risks related to drug misuse and methods for coping with social pressure, stress and other challenges. Working with members of the faith community and encouraging them to get involved in efforts to address the opioid epidemic. Working with local schools to offer programs and curricula to help foster healthy students and discourage misuse of opioids and other drugs. Working with the business community to support community efforts and create healthy and recovery-friendly workplaces. Increasing access to the overdose reversal drug naloxone. Creating, expanding, or supporting syringe exchange programs to reduce the risk of disease and overdose and improve access to healthcare and treatment. Working with first responders and emergency departments to develop post-overdose response strategies. Working with law enforcement, district attorneys, and the court system to develop pre-arrest diversion programs, support drug courts, and help people who are incarcerated get treatment. Supporting programs that help people who are in jail or prison get treatment for mental health or substance use issues while they are incarcerated and after they are released. When community efforts are supported by data. When community efforts incorporate prevention basics. When everyone with a stake in addressing drug misuse is at the table, working together. This includes government, business, healthcare, education, law enforcement, citizens, and other stakeholders. When they undertake a careful, systematic process that includes assessing needs, building capacity, developing a plan, implementing the plan and evaluating whether the plan is working. This process is called the Strategic Prevention Framework. Learn more here and here. Community Anti-Drug Coalitions of America (CADCA) is a valuable resource for community coalitions. Learn more on their website here. The North Carolina Association of County Commissioners started the County Leadership Forum on Opioid Abuse to engage local elected leaders in an informed discussion about the opioid epidemic, as well as develop collaborative strategies that enhance prevention, education and treatment. Learn more here. To learn more about proven community-based strategies, visit Blueprints for Healthy Youth Development or the Search Institute. To learn more about community coalitions, visit the SAMHSA website, the Surgeon General website or the Community Anti-Drug Coalitions of America (CADCA).